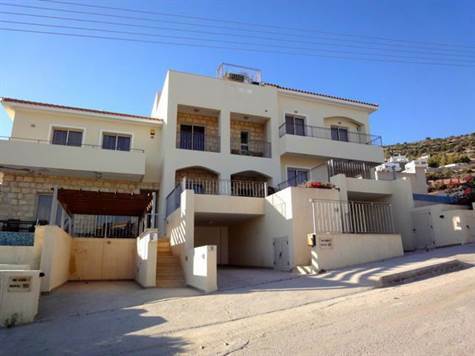 Peyia, Paphos - This impressive 2 bedroom property with roof top swimming pool is located near the popular village of Peyia which has a good range of local amenities. The property is designed on 3 levels with an open plan living room, cloakroom and well equipped kitchen on the ground floor, two double size bedrooms with en-suite facilities on the first floor, and the swimming pool terrace on the top. There is plenty of outdoor space including a large covered veranda with amazing views at the front of the property, and a private courtyard at the rear. One of many highlights is the stunning roof terrace with a 3m x 5.5m swimming pool, from where the sea and mountain views are truly breathtaking. The property is something truly unique with it’s modern design and quality finishes including provision for central heating. An added bonus is the large car port which provides covered parking and can easily be converted into a full garage. There are full title deeds and the property is being sold fully furnished.